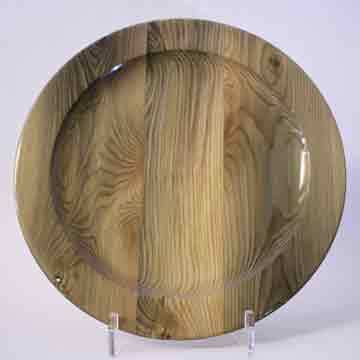 On receiving the wood, I left it to dry for several years. It was probably drying longer than necessary as I had no idea what I was going to do with it. 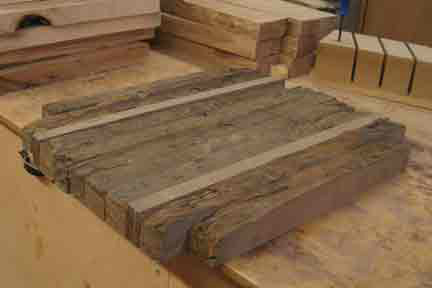 Finally, I took it to the sawmill and had it cut into short planks 1 1/2 inches thick. I decided to make chargers from this wood. Using this format, I was able to use as much of the original surface as possible. With that in mind I cut the wood so that I could show the outside surface. As it worked out, I wasn't able to get quite enough surface wood to make 2 complete chargers. The other 2 chargers came from the internal wood of the timbers. 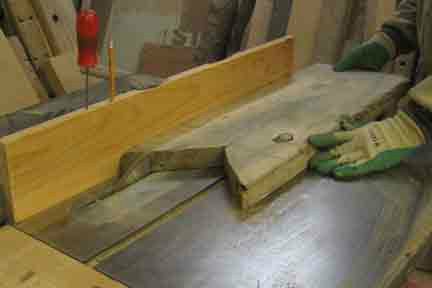 As you can see from the image below, I have had to add to strips of wood from the interior of the timbers. On the right you can see where I have pointed out the heart of the tree. 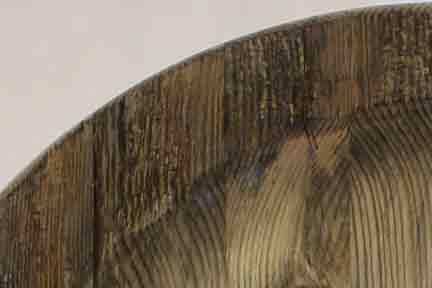 Below is a section that is about 1 1/2" inches wide. There are approximately 34 year rings in this section. This would make the tree at least 200 years old when cut. At the time that Champlain was founding New France, this tree was a seedling. Caroline Mach, the manager of the Dufferin County Forest, said that her best guess was that these trees were Larches. The wood turned easily and sanded fast. This was probably due to its age and that it was buried for many years. 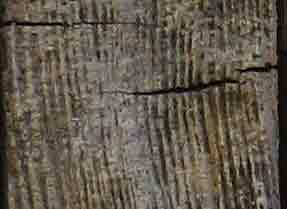 It had a gray colour throughout caused by the silt that impregnated the timbers. One of the chargers had to be sanded with extreme care as the wood just seemed to disappear under the coarser grits. When finishing wood with outside or natural edges I put one coat of finish on to seal it. The rest of the charger gets 5 to 6 coats depending on the wood. 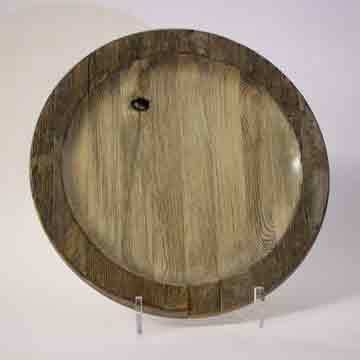 One coat on the rim still allows the rustic or original surface to retain that look. I have named these pieces: "Fort York", "A Growing Need", "Queen's Wharf" and "The Price of Progress"
Note: I have been informed that this timber may be contaminated with heavy metal due to being buried in an industrial area of Toronto. Food should not be served from or eaten directly off these chargers. Fort York was established by John Graves Simcoe in 1793. 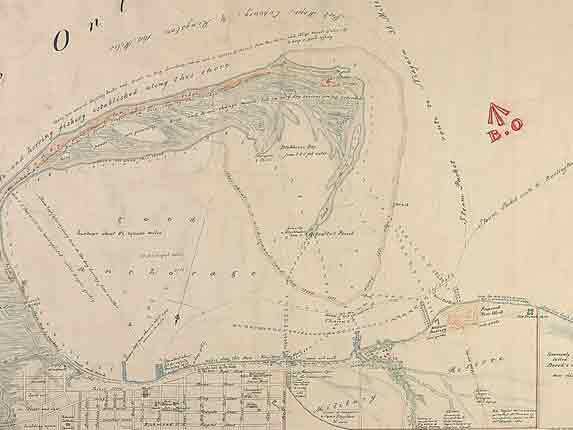 A garrison was built east of the modern day Bathurst Street in 1797. However, the town sprang up to the east end of the harbour because much of the land at the west end, including the entrance, was reserved for the military. At that time, there was only one way in to the harbour and this was at the western end. The eastern entrance was added by Mother Nature during a storm in 1852. In 1858 another storm widened the channel and made it permanent. As the town grew it became more difficult to move supplies from the piers at the east end of town to its western extremities and to the fort. 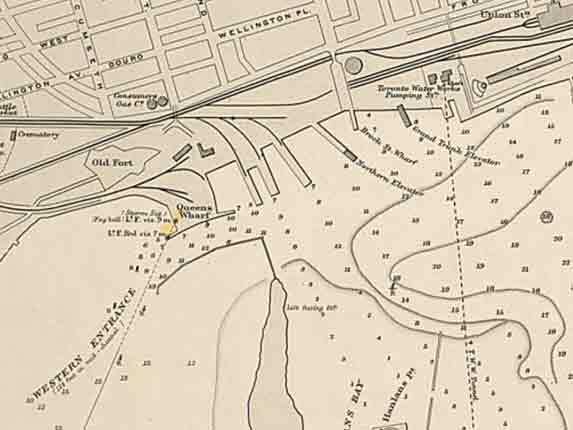 In 1833 a wharf was proposed for the shore near the foot in the vicinity of the bottom of the present Bathurst Street. A secondary use for the wharf was to prevent the growth of a sandbar that threatened to block the entry to the port. At that time the shoreline was near the current Front Street. Although there were smaller wharves near the west entrance to the harbour, they were not sufficient for commercial or military purposes. The original structure known as the New Pier measured about 724 feet in length and 24 feet in width. In 1837 it was upgraded by increasing the length to 800 feet. A 240 foot eastern pierhead was added at the same time. 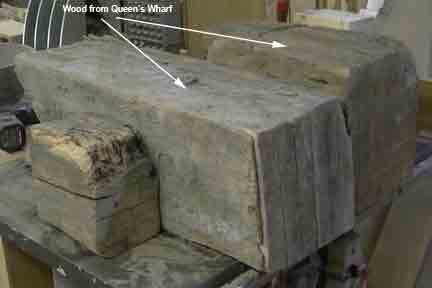 The pier was re-named Queen's Wharf in Queen Victoria's honour on her coronation. The Town of York was incorporated in 1838 and re-named Toronto. 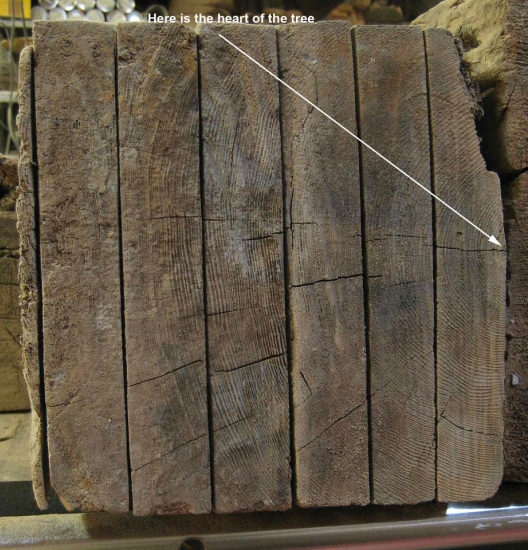 In 1850, the new Toronto Harbour Commission upgraded the wharf once again and addressed the need for repair including the replacement of some of the rotting timbers. The pierhead was extended westward and the wharf widened to 40 feet. This work was completed by 1856. After another 200 foot extension of the western pierhead in 1863, in-filling began in the 1880's between this pierhead and the shore creating a large area of new land. In 1906, it became evident that a new western channel was needed and construction was begun. This entrance to the harbour was about 400 meters south of the existing one and during construction more in-filling was undertaken. The new channel was ready for use in 1911. It was during this building of the new entrance that the Queen's Wharf ceased to exist as it became part of a new industrial area south of the rail lines. 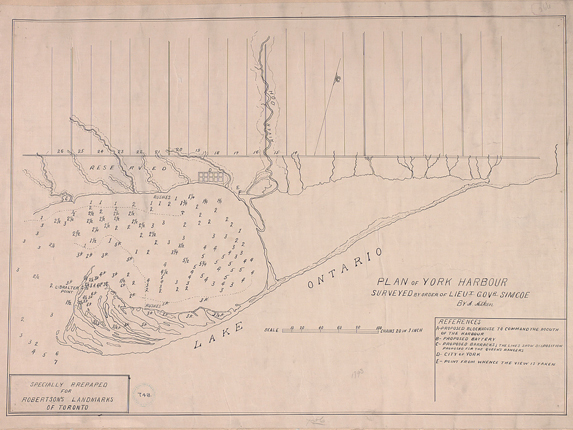 The Toronto Harbour Commission undertook most of this in-filling and finally completed this operation by 1929. 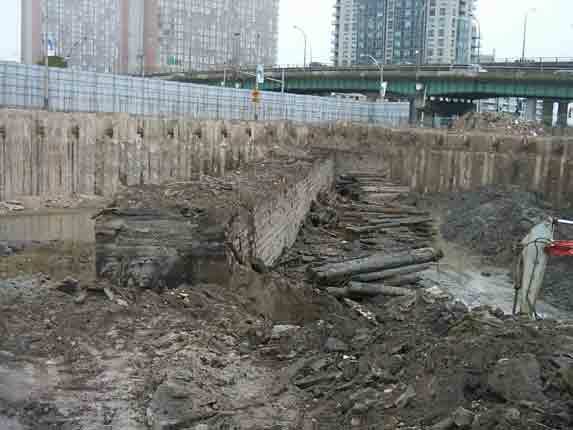 The Queen's Wharf came to light again with the digging of a foundation for a condo. After an exhaustive study of the artifact by Archaeological Services Inc., construction was allowed to go ahead. (This overview is based largely on this report.) Canadian Salvaged Timber removed the logs from the site and it was through the courtesy of Lambos Tsaousidis, the owner of the company, that Jim was able to obtain wood for this project. 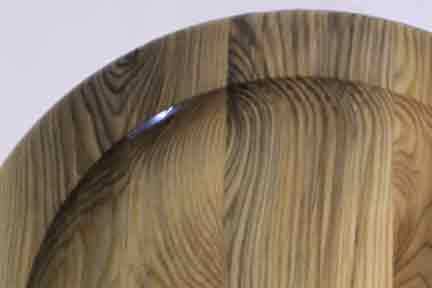 The other two chargers show the interesting grain patterns from the interior of the log. Two chargers have the rough exterior of the timbers on their rims.